I said last time that Zi-O would need to improve rapidly if I were to keep watching, and to the show’s credit these episodes are better…but not by much. They benefit from having some of the ground rules established and the viewer being slightly more used to the odd parts of the premise, but they’re still hardly what I’d call compelling viewing. Part of the problem here is, of course, that we’re hanging out with Ex-Aid again. Look guys, I know you’ve told me a thousand times in the comments that that show eventually got good, but I just never saw it. 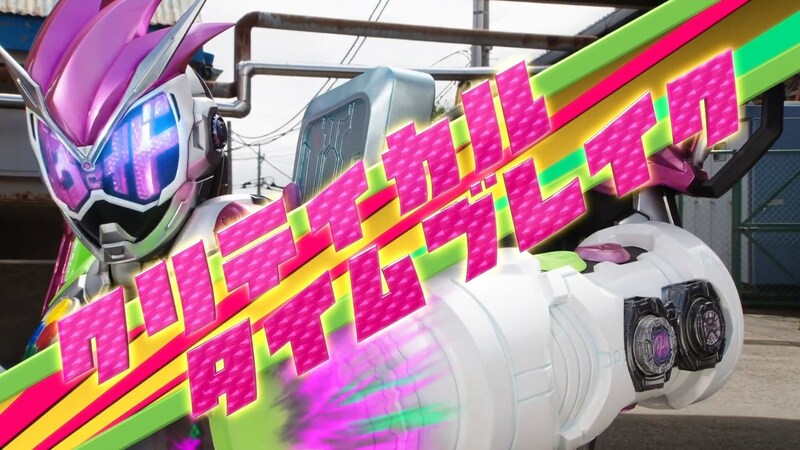 That also doesn’t really matter in this case, since the problems Ex-Aid brings to this duo of episodes are the inherent ones of its overbearing, day-glo designs, annoying hit effects, and general trashy videogame aesthetic. 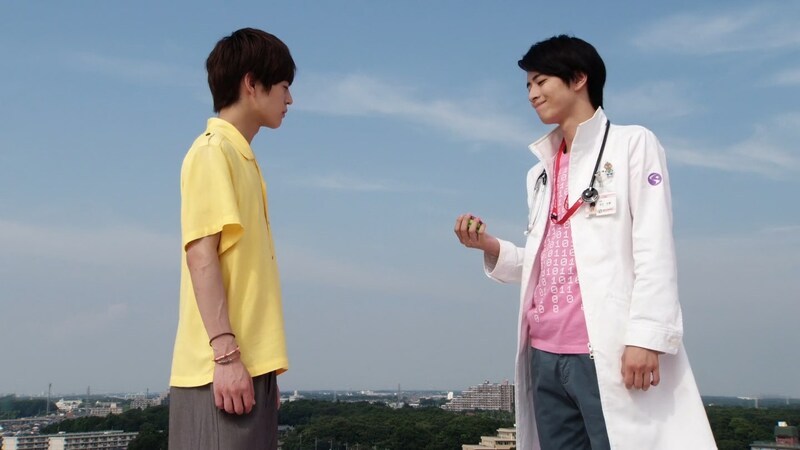 The weird ‘trapped inside a videogame’ stuff also adds needless complexity to a show which is already absurdly top-heavy with confusing changes of time and place It’s nice to see Emu and Hiiro again, but they weren’t especially strong characters to begin with, and with so little screen time they can’t really stamp themselves on the story in any meaningful way. Elsewhere Zi-O still struggles greatly with the basic beats of telling its story. 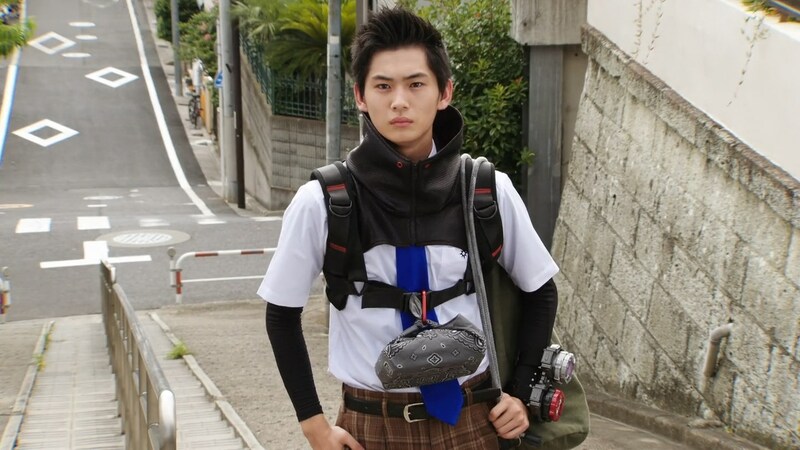 The idea of having Geiz and Tsukuyomi accompany Sougo to school is a funny one, and produces some neat sight gags (Geiz in a uniform but still wearing his bizarre neck…thing is the best), but it doesn’t really accomplish much as far as getting anything more out of them as characters. 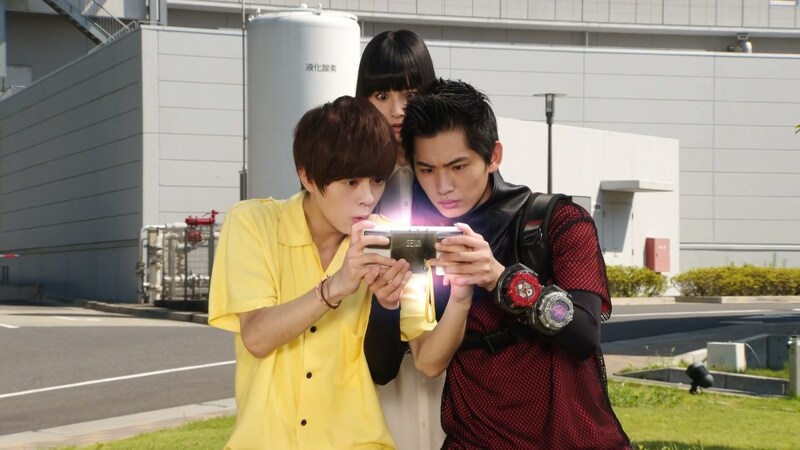 There’s no attempt to gain insight into Sougo’s normal life, nor to use the fish-out-of-water nature of the other two as anything other than mild comic relief. It’s early in the show, so I’m not exactly demanding we start digging deep into their psyches, but some sort of character development would have been nice, especially since we’re ostensibly past the breakneck opening. This isn’t really a sin confined to Zi-O of course, but it’s exacerbated here by just how poorly acted Geiz and Tsukoyomi continue to be, and how flat their dialogue is. Even now we’re four full episodes in, there’s little sense of these characters, or indeed Sougo himself, that we couldn’t have learned by reading the publicity blurb. The story still struggles mightily with handling the intricacies of time travel also, although it has improved somewhat, there’s still way too many times where I was genuinely confused as to what was going on. That’s a shame, because in other ways Zi-O does show some decent progress here. The idea that the Time Jackers can ‘restore lost time’ to people whose time was meant to be over has so far been one of the most fascinating parts of the fledgling mythology, and they expand on it and a smart, intriguing way here. The concept of sacrificing yourself to the Jackers to save one you love both brings a level of pathos to the process, and echoes the ‘deal with the devil’ overtones that has characterised many of the great Kamen Rider monsters down the years. There’s a lot of potential in the basic idea of the Time Jackers, and I hope they get creative with their powers in more ways so we can get some interesting dilemmas beyond ‘kick the monster til it explodes’. Hora seems cool and menacing on first blush too, although I’m pretty bummed that the Time Jackers have to resort to their own dumb mechs to actually travel through time. You’d think their inherent powers would be enough to do it, but I guess we have to have an excuse for more toe-curlingly awful special effects. As I said at the beginning, there are signs of improvement here, but they don’t address the fundamental issues. 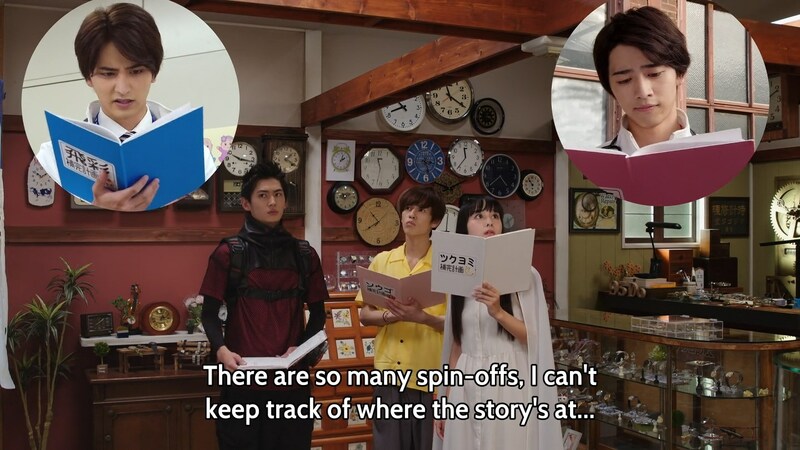 It’s not the surface of Zi-O which is the problem but the very foundations of the show, the basic tenets of storytelling, acting and visual appeal. That’s not to say the show is beyond redemption though, and we saw some very tentative baby steps here. More of that please. Apologies for missing a week so soon after the debut – i was overseas and far away from a computer. After a few weeks I’ve decided I like the opening song. It’s a good blend of the EDM style which more recent shows have adopted with the classic J-Pop sound which has characterised most of the Heisei era. Including the Konami Code is a nice touch, but why on earth is it written in German (aside from Japan’s ongoing cultural fascination with the language – see also Evangelion). There’s a pretty blatant reuse of Ex-Aid stock footage in episode 4. Wool’s Time Machine looks a lot like Ghost’s weird Lizard-Pirate Ship thing, although I’m unsure how deliberate that is. Next episode skips straight to Fourze, passing over Ghost, Drive, Gaim and Wizard. Considering we’ve already seen Geiz use Ghost and Drive themed powerups, I wonder if that means we’ll be permanently passing over those shows? Or are they just trying to break up a strict chronological order? Speaking of which, the preview reveals the presence of Takumi Inui and Masatao Kusaka, respectively Kamen Rider Faiz and Kamen Rider Kaixa from Kamen Rider 555.